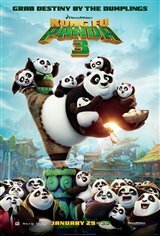 When Po's (Jack Black) long-lost panda father suddenly reappears, the reunited duo travel to a secret panda paradise to meet scores of hilarious new panda characters. Po runs into two hugely epic, but different threats: one supernatural and the other a little closer to his home when the supernatural villain Kai begins to sweep across China defeating all the kung fu masters. Po must do the impossiblelearn to train a village full of his fun-loving, clumsy brethren to become the ultimate band of Kung Fu Pandas!